Note: This blog does not really pertain to Palm Beach County, but it is a fun story from afar. 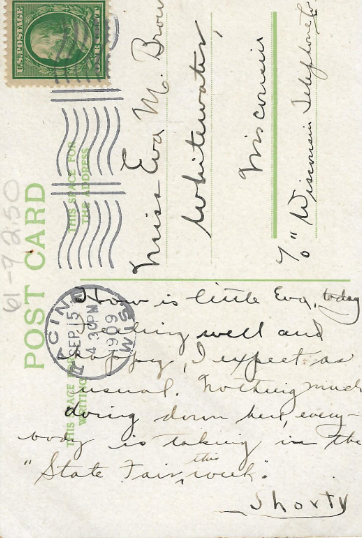 A penny postcard at the beginning of the twentieth century was the text message of its time. People sent them by the millions to friends and family near and far to send a short message, complete with a pretty scene of where they were, just like texting a photo. I’ve collected postcards for years, mostly for the rare photos of places near where I live in Florida, or places I have visited. 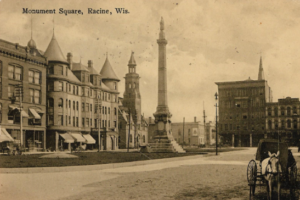 At a postcard show held February 22 in Pompano Beach, Florida, I decided to look for Racine postcards. My dad Jack Pedersen and his parents John and Lillian Pedersen were born in Racine, and I enjoy learning more about Racine’s rich history. One vendor at the show had bought out several collections and was selling all postcards for a dollar a piece – a bargain hunter’s paradise. I dove into the collection and found six cards from Racine – familiar scenes such as Monument Square and Horlick’s Malted Milk. I bought them all, and tucked them away in my bag. 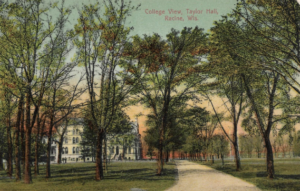 Later when looking at them with a friend, we noticed that three of the Racine cards were to and from the same people. 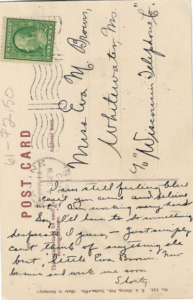 A man who signed the cards “Shorty” sent the postcards to his sweetheart, Eva M. Brown, who was living in Whitewater. 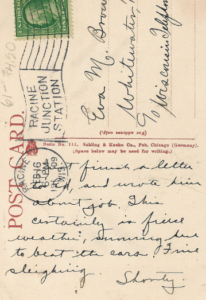 He addressed them to Eva in care of the Wisconsin Telephone Company. 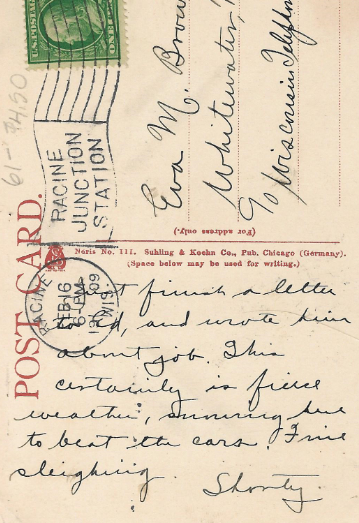 The three cards were written in February, April and September, 1909. The messages were sweet and innocent; “Just simply I can’t think of anything else but little Eva Brown.” This drew me into the story – who were Shorty and Eva? Did their romance blossom? I started searching with Ancestry.com, using Eva’s information since I had her full name, and guessing her to be born about 1890. I first found her on the 1905 Wisconsin State Census, living in Whitewater with her parents, George and Lucy Brown, and six siblings. Eva Maude Brown was born in Hebron, Wisconsin, May 27, 1888. The 1910 U.S. Census confirmed I had the right family – Eva’s job was listed as telephone operator. 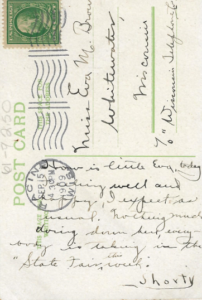 It is interesting that Shorty sent the postcards to her place of work – did he want to hide their romance from her parents? Eva was also in several family trees in Ancestry. Many of those trees listed her as being married to E. Bruno Waldin, and that they lived in Beloit. 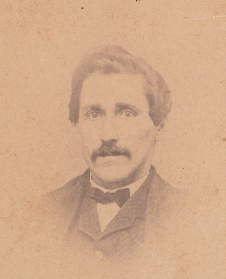 Waldin was a pharmacist, eventually owning his own pharmacy in Beloit. The crucial question – was “Shorty” and Bruno Waldin the same person? Bruno Waldin was born in Reedsburg, Wisconsin in 1888, and married Eva in 1912. 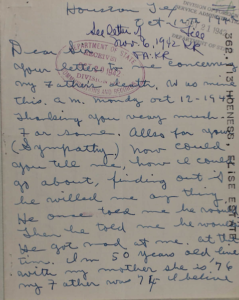 On Bruno’s 1917 World War I draft registration card, he listed his profession, address, and physical characteristics – and there it was – he listed his height as short! The World War II draft registration card listed his height at 5 foot 4 ½ inches. But what was Bruno’s tie to Racine? 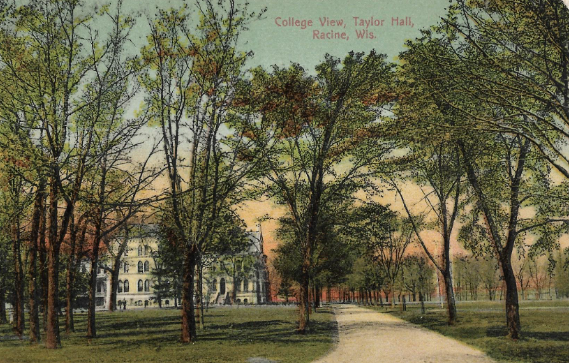 A search of the Racine Journal-Times archive at Newspapers.com didn’t have any articles mentioning a Bruno Waldin from that time period. I could see though how his name was probably often misspelled as Walden – and that search cracked the case. 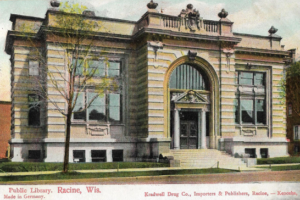 A January 10, 1910 article mentions Bruno Waldin and four other men who had taken the druggist’s exam in Milwaukee – and all had failed! So Bruno Waldin and Shorty were one in the same. He was in Racine, probably interning with a pharmacist after his college studies, preparing for the pharmacy exam. He did pass the exam in 1913, and became a registered pharmacist. Bruno and Eva had a lifelong marriage, ended by Bruno’s passing in 1966 at the age of 78. There were no children in the marriage. Bruno and Eva retired to Fort Atkinson. 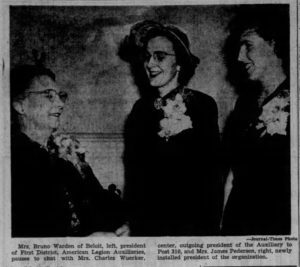 For decades, Eva was very active in the American Legion Auxiliary, serving in many roles including district president in 1946. Her activities in the organization brought her all over Wisconsin, including many meetings in Racine. She passed away in 1973 at the age of 85. Eva Brown Wardin (left) in 1950. Yes, sometimes a good story does have a happy ending. 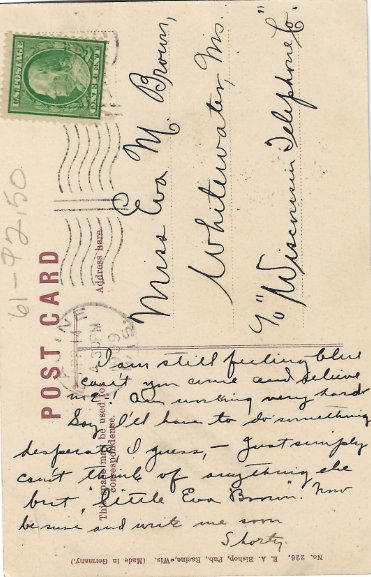 And for a chance finding at a postcard show more than 1,000 miles from Wisconsin, the sweet love story of Eva and Bruno might have never been told. 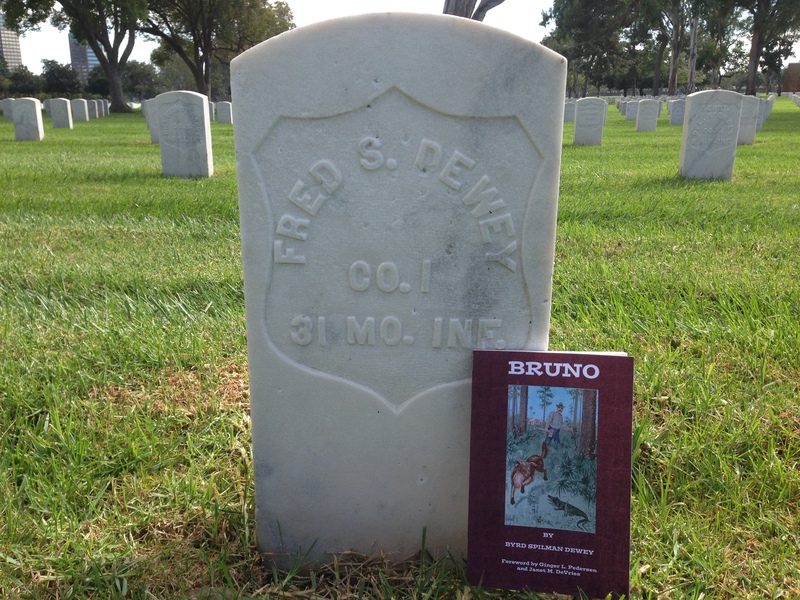 January 5, 2019 marks a century since the passing of Fred S. Dewey, one of the most important South Florida pioneers. 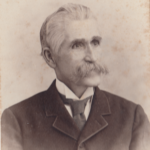 Frederick Sidney Dewey was born October 10, 1837 in Bloomfield, Indiana. His family had moved west from Massachusetts, where father Lonson Nash Dewey was born. Fred was a descendent of Thomas Dewey (often called “Thomas the Settler”), whose seven sons and their descendents count such notable names as Admiral George Dewey, the hero of the Spanish-American War, Thomas Dewey, governor of New York and presidential candidate, John Dewey, educational philosopher and professor, and Melvil Dewey, developer of the Dewey Decimal System and professor. Fred’s father Lonson ran a hat factory in Indiana, where he had homesteaded much land. He married, but first wife Harriet Day died in 1835. He then married Nancy Jones, and Fred was their first child. Soon four more boys followed, and a daughter, Hattie. The family continued their trek westward, with Nancy serving as teacher for the children. Their next stop was Scott, Illinois, then on to Marion, Illinois. 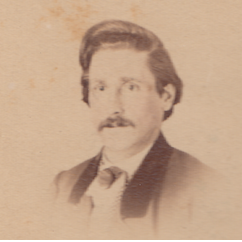 In 1862, Fred joined the Union Army serving in the 31st Infantry from Missouri. He was quickly promoted to Master Sergeant, and saw action in Mississippi. But Fred was removed from duty not from war injuries, but illness, which killed more soldiers than the battles did in the Civil War. He had contracted tuberculosis, and was hospitalized for months in Mississippi. Finally, in 1863, he was discharged from the Union Army, not expected to live. Fred made his way back to Illinois and settled in Salem. He was a trusted public servant in many roles including deputy sheriff, notary, and bank clerk at the Salem National Bank. 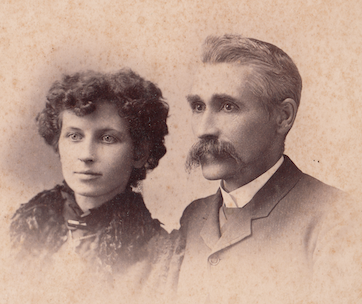 It was in Salem that he met Julia Bird Spilman (the later Byrd Spilman Dewey) and they married September 25, 1877. Fred was still suffering from the effects of tuberculosis; the doctor’s recommendation was to seek a warmer climate. 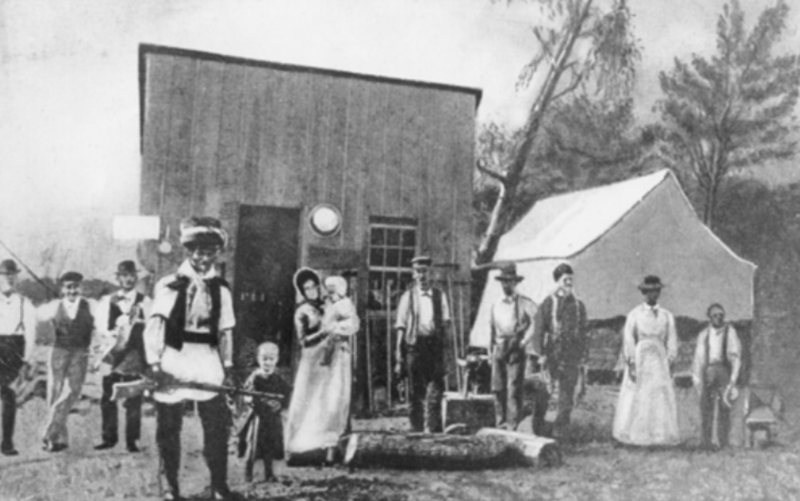 In 1881, Fred and Birdie headed to Florida, and first bought land in Zellwood, Florida. Their attempt at citrus growing was a failure, so Fred took up his old job as an accountant in Eustis before the pair headed to Jacksonville. Fred worked in Jacksonville at a few lumber companies as an accountant and bookkeeper. After the loss of their only child, the two sought a new adventure in the wilds of South Florida. 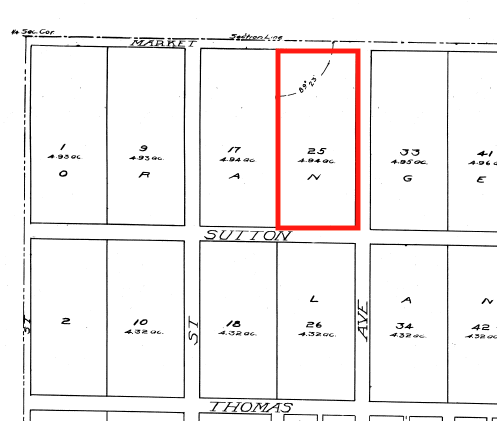 In 1887, Fred staked a claim to 78 acres in the highlands north of West Palm Beach in what today is Northwood Hills. 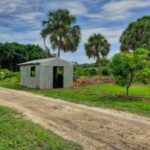 On that land Fred cleared a few acres for growing tropical fruits and built a four-room house. He worked in Palm Beach, at the Hendrickson Store and the Brelsford Store, along doing carpentry work as it presented itself. He also served as the Health Officer in Jupiter to inspect incoming ships and boats for possible Yellow Fever victims. 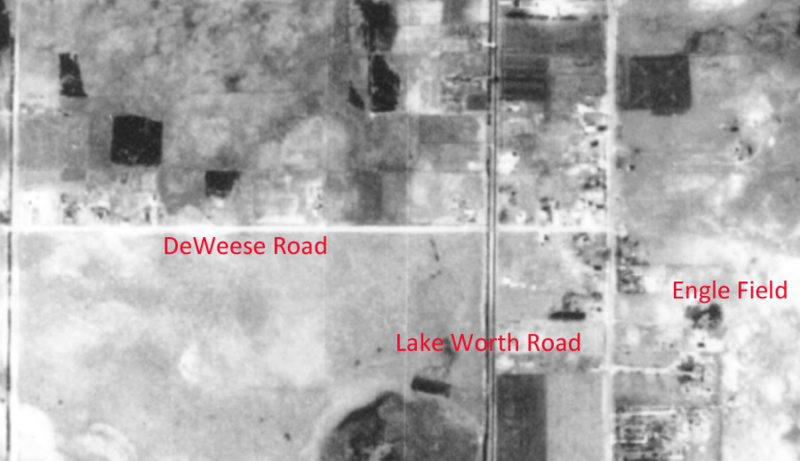 In 1890, the Deweys purchased a 5-acre plot of land with a small house on the shores of Lake Worth about a mile south of West Palm Beach. Fred expanded the existing structure to become a beautiful lakeside cottage. He also became a county officer, serving as notary, county commissioner, tax collector and tax assessor for Dade County, which at that time stretched from the upper Keys all the way to Stuart. This meant that he would have to be away from home for days or months as he traveled from homestead to homestead collecting taxes. He served in that role until 1892. One of his tax collecting trips was chronicled by Mrs. Vincent Gilpen, and later published in the Tequesta Journal in 1942. The hardships of such a job were chronicled in this adventuresome tale. 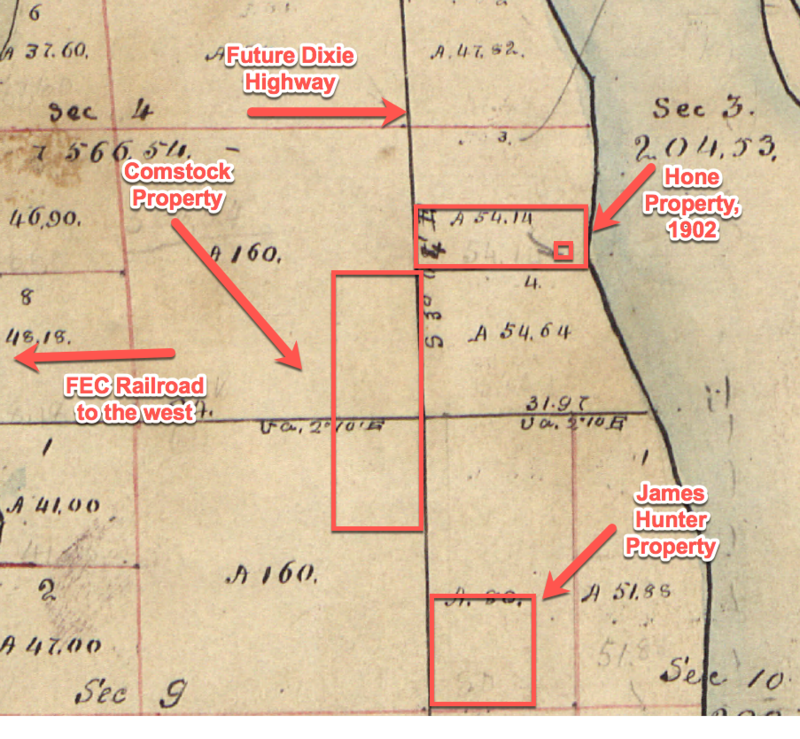 Fred and Birdie began to buy lands in Dade County, many times quickly flipping them for nice profits. 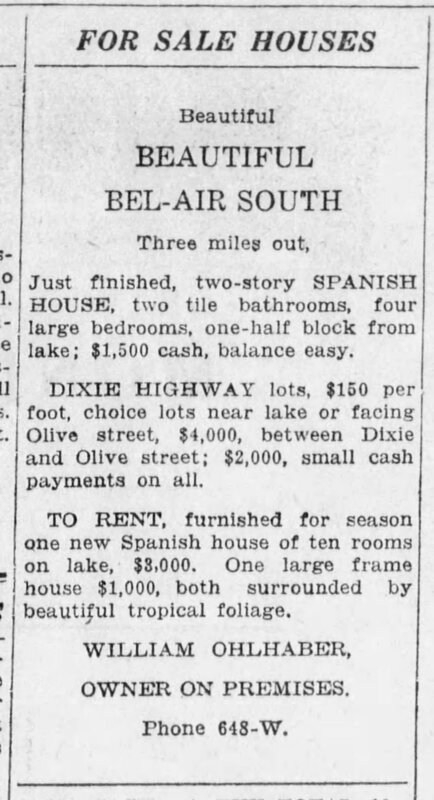 In 1892, Birdie purchased 160 acres at the foot of Lake Worth, in what was called the “Hypoluxo Garden Lands.” Her $700 investment was quickly flipped to William S. Linton (founder of Delray Beach) for $6,000. The deal fell through when Linton defaulted. 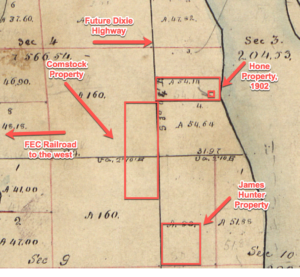 The Deweys sued Linton and got their land back in 1897. 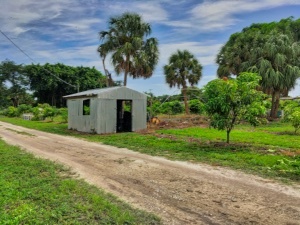 They platted the land in two developments – The Town of Boynton, a 40-acre townsite, and Dewey’s Subdivision, 5-acre farm plots along the intracoastal canal where tomatoes grew well. 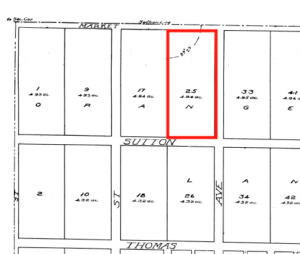 The Deweys began selling the lots and farming plots. 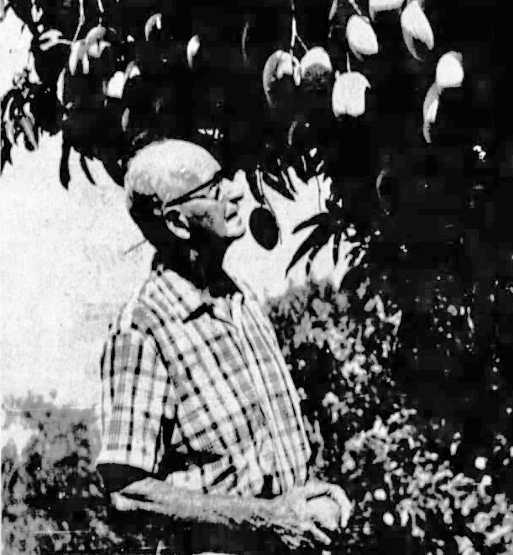 Fred planted a seven-acre citrus grove just south of where the Ocean Avenue Bridge is today in Boynton, on the north end of what is Sterling Village. Fred’s talent in real estate and genial nature didn’t go unnoticed. He became a land agent for the Florida East Coast Railway Company, the Boston & Atlantic Land Company, and the Sawyer Land Trust. 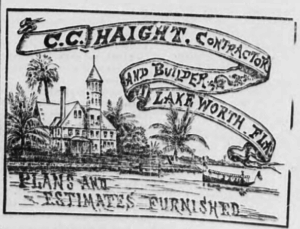 These interests held thousands of acres of valuable South Florida land, gained through the building of the railroad and digging of the canal from Boynton to Fort Lauderdale, today’s Intracoastal Waterway. 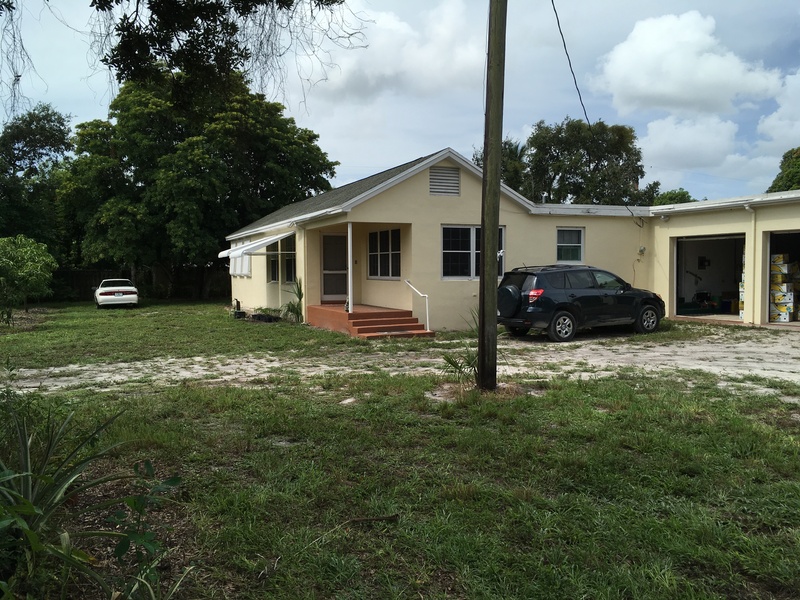 Fred’s territory went from Boynton south to Fort Lauderdale; according to newspaper reports, no one sold more land than Fred. 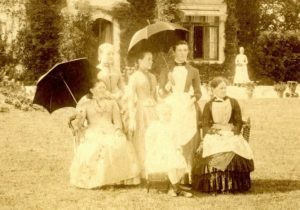 The couple lived in West Palm Beach until 1906, when they returned to Jacksonville as Fred’s health was beginning to falter. The couple sold their West Palm Beach lakefront home in 1909, and built a new home in Boynton at the southwest corner of what is today Federal Highway and Boynton Beach Boulevard. 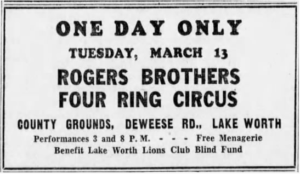 According to Bertha Chadwell, Boynton pioneer, she would drive the Deweys to Palm Beach so that Fred could meet with Henry Flagler on real estate matters in South Florida. They lived in Boynton briefly before Fred’s health again took a turn. At the age of 73, Fred was admitted to the Mountain Home Veterans Home at Johnson City, Tennessee with multiple ailments. He was then transferred to a soldier’s home in Virginia, and then on to the Sawtelle Soldier’s Home in Los Angeles, California. Birdie sold her Palm Beach house on Seabreeze Avenue and moved to California to be near Fred. He passed away January 5, 1919, and is buried in the Los Angeles National Cemetery. I visited his grave site in 2016, and the experience was quite moving, to visit the earthly remains of a Florida pioneer. He served his country and he served his adopted state in so many different ways. His offspring, the little Town of Boynton, is today a thriving community of over 69,000 residents. Every month during the fall and winter, Janet DeVries Naughton and I conduct cemetery tours at Woodlawn Cemetery in West Palm Beach, Florida. 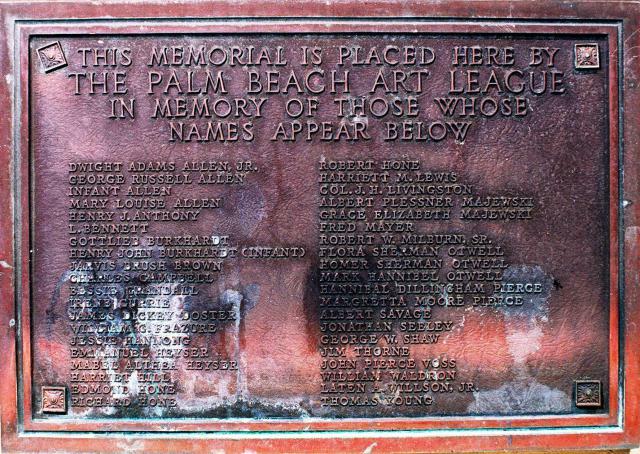 At Woodlawn, many of Palm Beach County’s pioneer citizens forever rest in the paradise they helped tame more than a century ago. One of the citizens we feature is Otto Wilhelm Weybrecht. 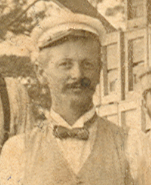 Born in 1866 in Germany, Weybrecht came to the United State as a child in 1871. The family had first settled in New York. 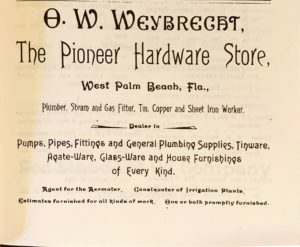 By the mid 1880s, Weybrecht was working as a plumber and tin smith in Jacksonville. With wife and first child, the family moved to Palm Beach in 1892, and to West Palm Beach in 1893. Weybrecht was one of the first lot buyers on the newly minted plat for the town of West Palm Beach. 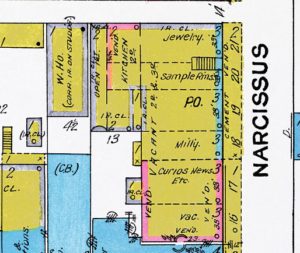 He bought a lot on the south side of Clematis, where the Harris Music Loft now sits. 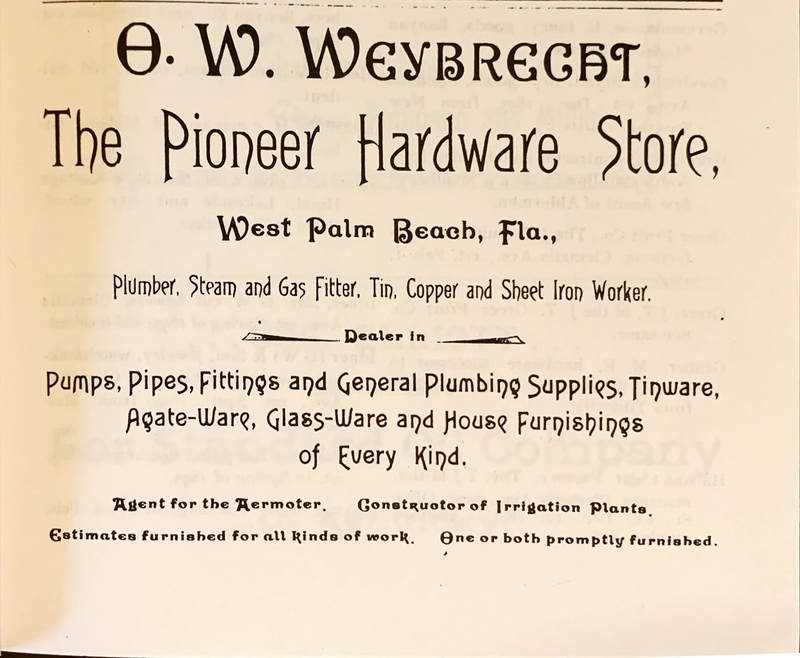 Weybrecht built a 22 by 10 foot wooden building to house his dry goods store and tin smith shop, the first store on the peninsula between Fort Pierce and Miami. 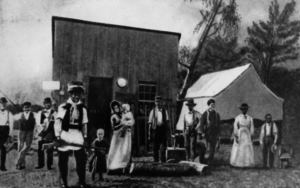 The family lived in an adjacent tent. The opening was captured in a famous photo that is often seen in publications, with Seminole Indian Billy Bowlegs. 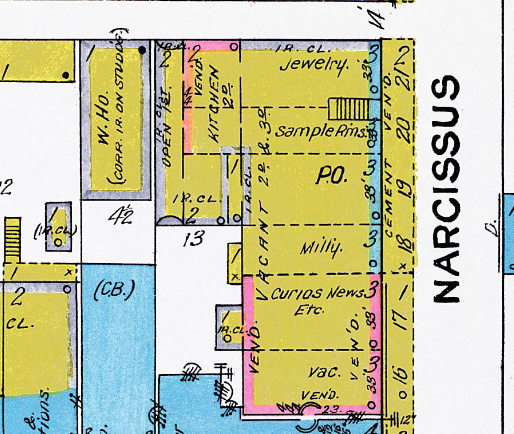 The store burned in 1896 in a fire that consumed most of the wooden buildings on Clematis Street. Several Weybrecht family members are interred in Woodlawn. During the tour, I noticed daughter Louise Weybrecht had died in 1910, a branch adorning her head stone, bearing the inscription “Our Louise.” She was but 12 when she lost her life. I had assumed that a childhood illness had taken her life, as unchecked disease was so rampant. Curiosity about Mr. Weybrecht revealed a much grimmer fate for poor Louise. She had been murdered. 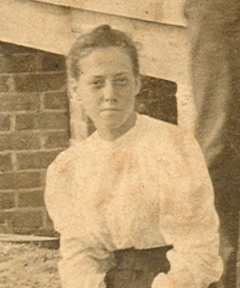 Mary Weybrecht, Otto’s wife, ran a winter boarding house in a building Otto constructed in 1905. The building was located at what today is 422 Clematis Street, just west of the Dixie Highway. 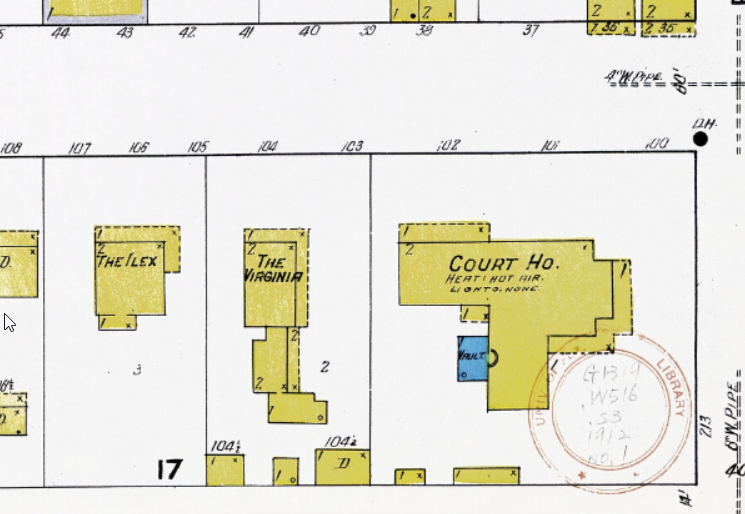 At that time, the courthouse was located at that corner, in the former school house building. Next door was another boarding house called the Virginia. Mrs. Weybrecht’s boarding house the Ilex housed seasonal workers in West Palm Beach. A young man, F.V. Pierce, hailing from Rochester, New York, was in South Florida for the winter season. He and a friend were selling “flatirons” (clothing irons heated on a stove) to make ends meet. Pierce was well known in West Palm Beach and Miami as a friendly man of about 30, but became sullen and violent when drunk. Pierce had been arrested in the winter for public drunkenness and fighting; he attempted suicide in the jail cell by cutting his wrist. He owed Mrs. Weybrecht back rent and again found himself penniless. He gave a check to young Louise to take to her mother upstairs, who had laid down not feeling well. He bounded up the stairs after Louise; she attempted to shut the door but Pierce burst through, and shot them both. He then turned the gun on himself, dying instantly from a gunshot to the head. Louise was hit in the abdomen, and Mary in the upper chest. At that time, West Palm Beach had no hospital. The two were probably treated at the doctor’s house, or at the boarding house. The outlook for Louise was grim as there was little the doctors could do. Louise died the next day, April 10. Mary survived the shooting, and lived on Fern Street until her passing at age 58 in 19; Otto passed away in 1912 at the age of 48, perhaps never recovering from the tragedy. We know little of Louise, save for a series of articles about a 1909 piano competition in South Florida, where she was one of the top contestants. Newspaper accounts came from several Florida and national papers, but none from West Palm Beach as. 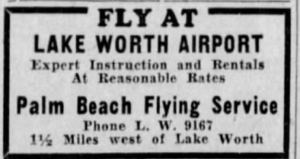 the Lake Worth News or Tropical Sun were not preserved. Given the tragedy, and the standing of the Weybrecht family, the community certainly must have been shocked at the tragedy. Her siblings must have carried that burdon the rest of their lives; her brother August Weybrecht was the last to pass away in 1991 at age 90. We see the violence in our world today, but even the pioneer days saw their share of tragic death. Note: I had been working on the Hone case during the past week when The Palm Beach Post published their version August 26, 2018. Coincidently, Eliot Kleinberg and I were working on the same story from 116 years ago! But a good one it is, and my version offers more in-depth details on this most infamous crime. I was going to run this as a serial story due to its length, but the story is presented here in its entirety. This blog is the result of the first complete investigation and report of the most infamous crimes in the West Palm Beach pioneer era. Although frequently mentioned, most of the information written about the Richard Hone case in newspapers or on the Internet is incomplete, and in some cases, wrong. 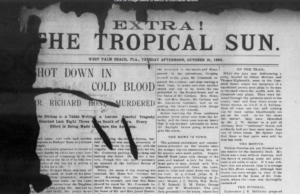 Every available issue of pioneer-era newspapers (The Tropical Sun and the Miami Metropolis) were researched, along with probate records, baptismal and marriage records, land transactions, and maps. A storm is raging along the shores of Lake Worth, an unusually violent Fall thunderstorm. Richard Hone, a 44-year-old Englishmen and naturalized citizen, sat in his country estate home three miles south of West Palm Beach, composing a letter to one of his sisters in England. Nearby sat Hone’s wife Mary, reading by lamp in the dark, dusky evening. Among the fits of light and cracks of thunder, a figure lurks outside near the window. The muzzle of a rifle bursts through the window screen; a shot is fired, hitting Hone. He grabs his head and yells “MY GOD, I AM SHOT!” It was the last words he would ever speak. Richard Hone was born in 1859 to Harry and Lucinda Clarke Hone in Stoke Orchard, Gloucestershire County, England, the youngest of nine children. Hone’s father had amassed a 640-acre estate in Stoke Orchard, about two hours northwest of London. 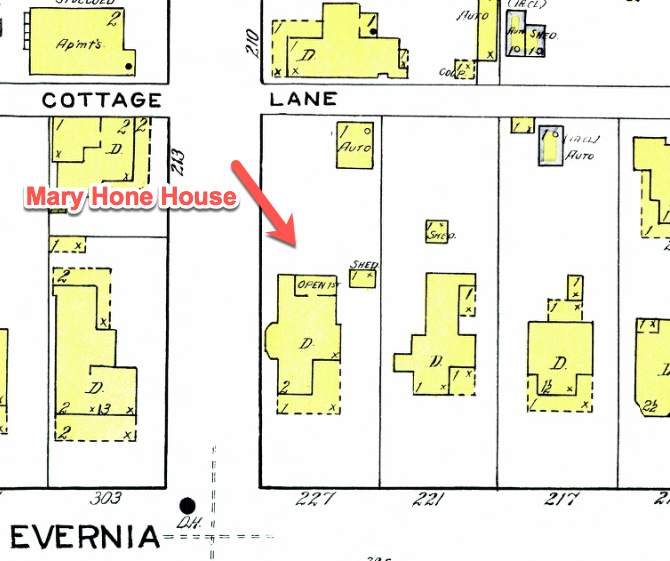 Richard Hone last appears with the family on the 1881 census, living with his mother Lucinda and siblings on the estate. With so many older brothers and sisters, little of the estate would be left to Richard. He decided to try his luck in America and arrived in New York November 20, 1894, and made his way to California. Not finding his fortune in California, Hone arrived in the-then Dade County, Florida, which encompassed what is today Dade, Broward, Palm Beach and Martin Counties. 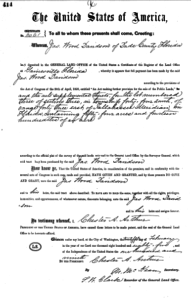 On February 9, 1895, Hone bought 20 acres of land for $1,000 from Colonel John Huntington Jones and his wife Elizabeth Ross Jones. They were Rhode Islanders who owned much land in the West Palm Beach area. They were not related to Mary Jones, as has been said in other accounts. James Wood Davidson, a noted scholar and author from South Carolina, had acquired 108 acres along the shores of Lake Worth in 1885 through the Homestead Act. Davidson sold off the track in pieces, and Hone was now the owner of 20 of those acres, ready to start his farming enterprise. 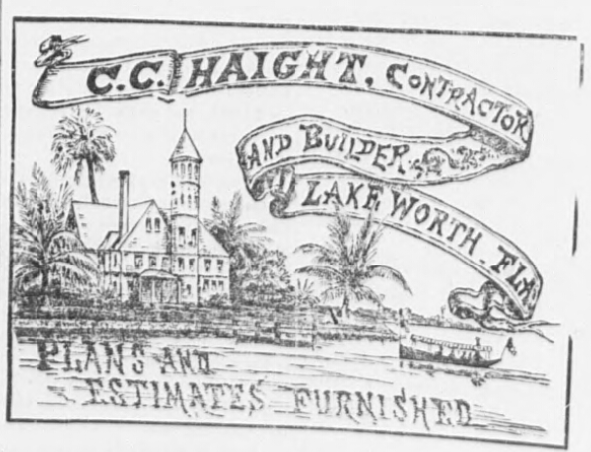 Hone contracted with well-known pioneer-builder and architect Charles C. Haight for a house. “The building will be two stories high, with wide porches all around it, an ornament along the Lake. 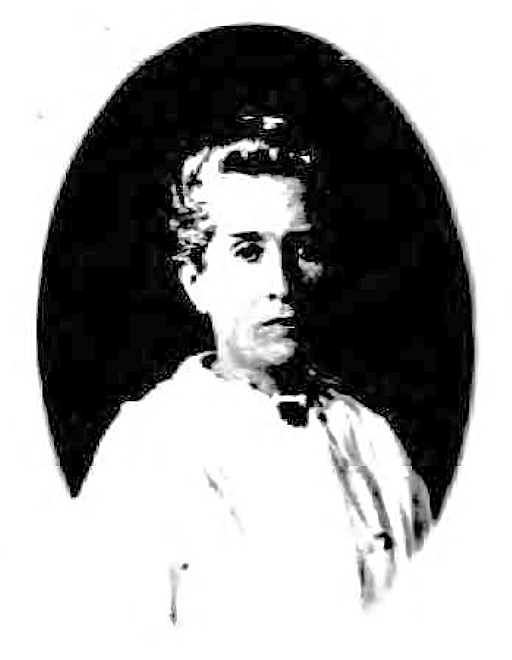 About the middle of July, Mr. Hone will leave for England, but will soon return with the lady who will preside over this new home.” (The Tropical Sun, May 23, 1895). 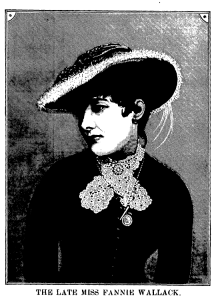 Hone sailed back to England to marry a woman from his hometown, Mary Jones, 34, the daughter of Henry Yates Jones and Elizabeth Buckle Jones. The Jones were also farmers, owning a 320-acre estate. Richard and Mary married August 20, 1895, in Gloucestershire and sailed immediately from Southhampton, England, arriving in New York August 31, 1895. From there they would take the train to West Palm Beach to begin their wedded life. 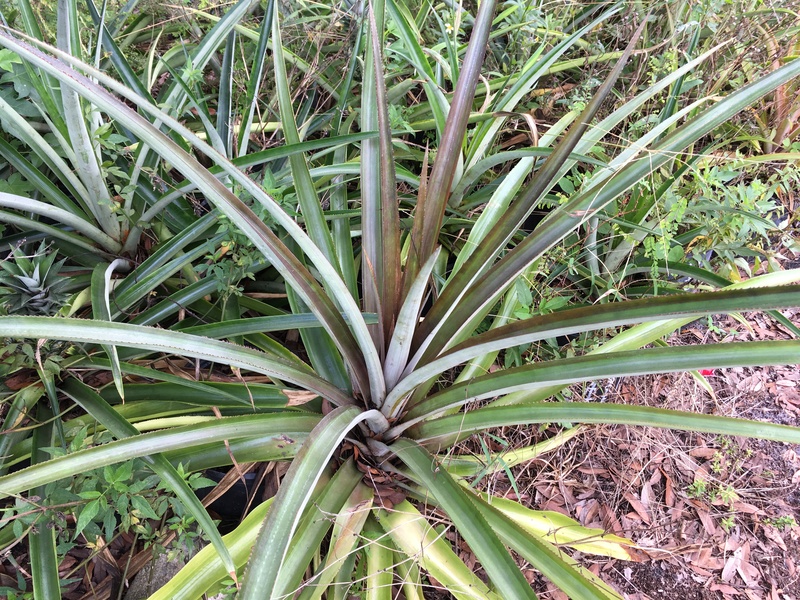 Hone went into the pineapple farming business, which was most lucrative for early West Palm Beach farmers. Local plantation owners included J.W. Comstock, George Matthams, James N. Parker, George Swift, and Nellie Clow, who planted the pineapple “slips” in the sandy soils in which they thrived. Fresh pineapple was a summer delicacy that could be shipped quickly north on the train and commanded high prices in northern city markets. Hone raised the popular varieties of the day including Natal Queen and Red Spanish. He built wood lathe shades over the three acres of fields he had in cultivation to keep the sun from burning the fruit. In March 1897, a baby girl was born to the Hones, but her life was short. Two more children were to follow; Edmond in 1899, and Robert in 1900, but they too were to meet the same cruel fate as the little girl. The Hones remained a childless family. The Hones became American citizens May, 1897 at the Dade County Courthouse in Juno, Florida “Richard Hone passed through town a few days ago on his way to Juno where he went to take out his final naturalization papers. 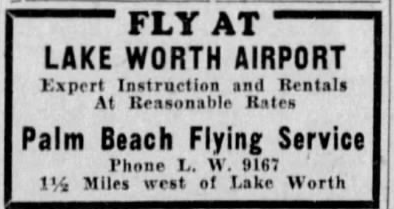 In the future Mr. Hone will fly the American flag over his ‘Lake Shore’ place.” (The Tropical Sun, May 27, 1897). 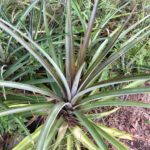 As the years went on, Hone continued with raising pineapples and vegetables as the land would support. He is listed as visiting England in 1897 as a returning citizen, but it is not known if Mary also accompanied him on the trip. Hone was a popular and respected figure around town, and the Tropical Sun staff were most appreciative of his generous nature: “This office is under many obligations to Richard Hone, whose gentlemanly features, accompanied by a sack of fancy pines, put in an appearance just before we were going to press.” (The Tropical Sun, June 10, 1897). 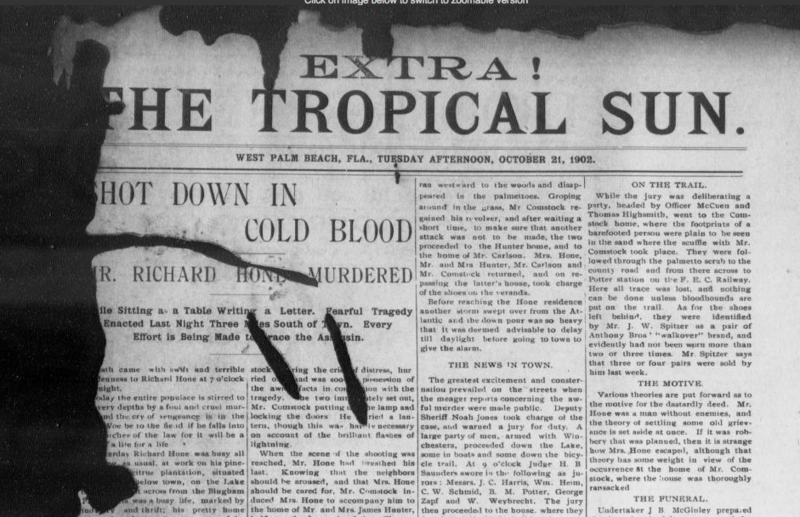 Monday, October 20, 1902 was a typical evening in South Florida. The Hones had finished supper, and were busy with their reading and correspondence. The storm raging outside had come in off the ocean. As the shot rang out and hit Richard Hone, he arose and quickly stumbled backward, falling in the hallway. His wife put a pillow under his head, but she knew there was little she could do for her dying husband. Mary ran to the nearest neighbor, James Willis Comstock, who lived a few hundred yards to the southwest of the Hone property. He heard her screams, and she told of what had happened at the house. Comstock put out the lamp in his house, grabbed his revolver, locked the door and the two hurried back to the Hone house among the claps of thunder. When reaching the Hone house, Comstock saw that Hone was dead, a pool of blood beside the body. It was an hour walk to town to find the sheriff, and another squall line was about to hit with sheets of pouring rain. 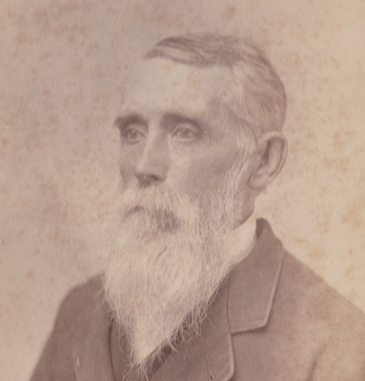 Comstock could not leave Mary by herself, so he thought to bring her to the next neighbor to the south, pineapple grower James Hunter and wife Gertrude. They went down the trail by lantern, passing Comstock’s house. Comstock noticed that his front door was now open, and that a rifle was resting against the door. The screen door had been propped open with a pair of shoes. Someone was inside the house. He urged Mary to stay back while he went inside, but instead she rushed to the porch. Comstock went to grab the rifle from the door, and out of the darkness he was tackled from behind. A fight ensued over the rifle, with both men struggling to gain possession. Mary took part too, but was quickly thrown aside by the assailant. The scuffle knocked over the lantern, making it difficult to see the assailant, but the lightning flashes revealed him to be African-American. Comstock went for his revolver, lost his grip on the rifle, and fell backward. The assailant kicked the revolver away. Comstock expected to be shot in cold blood like Hone, but instead the assailant fled west with the rifle through the sand pines and palmettos. Comstock found his revolver, and Mary and he walked down the trail to the Hunter home. Another neighbor, Mr. Carlson, joined the group. All walked back to the Hone house, and stayed there the rest of the night as the monsoon rains returned. At daybreak, Mr. Comstock went to West Palm Beach and found Deputy Sheriff Noah Jones. A posse of men armed with Winchester rifles went south down the lake by boat and on the bicycle trail. 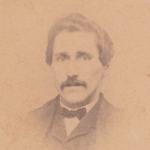 As was the custom of the time, the designated coroner, attorney Hutson B. Saunders, formed a jury to examine the body and crime scene so the cause and manner of death could be investigated. 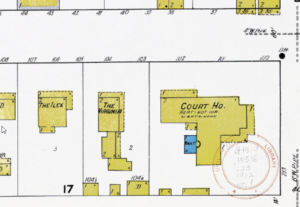 Coroner Saunders swore in his jury – J.C. Harris, William Heim, C.W. Schmid, Bernard M. Potter, George Zapf and Wilhelm Weybrecht. Dr. Henry C. Hood examined the body and found that the bullet had penetrated the right arm, entered the chest and had probably pierced the heart. Dr. Hood extracted the bullet and found it to be a .32 caliber rifle ball. The jury examined the scene and the evidence and proclaimed the cause of death was gunshot, and the manner was murder by unknown assailant. Deputies assembled at the Comstock house to examine the crime scene there. The deputies could see the bare footprints of the assailant where he had the scuffle with Mr. Comstock. The small trail through the palmetto scrub led to the county road (where Dixie Highway is today) and on to “Potter’s Station” on the Florida East Coast Railway. Although not described in detail, it was probably a loading dock where farmers could bring produce for shipping north. The officers concluded that the assailant had headed north or south on the train tracks. On walking back to the house, the deputies found the assailant’s cap. 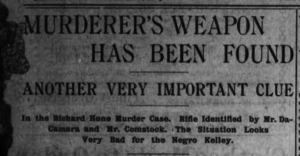 They also examined Mr. Comstock’s door, which showed it had been broken with the muzzle of a rifle, which left a clear .32 caliber sized impression on the door. The shoes left behind were particularly interesting. They were a brand of shoe called “Walkover” and appeared to be new (the company was founded in 1758 and is still in business). The man who sold shoes at Anthony’s Store stated that only 3 or 4 pair had been sold in the last week. Further inquiry into the shoes showed that an African-American man, William Melton, had reported his new shoes stolen to the police on Monday morning. 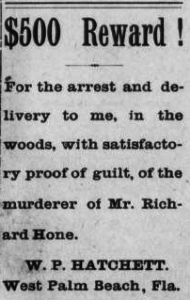 This would later provide an important clue linking the murderer to the crime scene. Richard Hone’s funeral was attended by many West Palm Beach residents. The Reverend S. D. Paine of the Union Congregational Church conducted the funeral services at the Hone house. The body was then transported to Lakeside Cemetery via boat for burial, which did not take place until 5:30 in the evening, when dusk had set in. A few months before his death, Hone donated $5.00 for the improvement of Lakeside Cemetery – little did he know he would be so soon among its residents. “The scene at the grave was weird and impressive, in the extreme. A few flickering lanterns cast a fitful glare on the friends gathered around the open grave, while a solemn stillness reigned, save for the voice of the officiating minster who performed the sad last rites.” (The Tropical Sun– October 24, 1902). Marion E. Gruber, L. Marvin, George Wellington, George C. Currie, and James J. Hunter served as pall bearers. Following the services, Mary Hone stayed with the Wellington family in town, fellow Englishmen who could offer her solace in her time of need. The investigation as to the identity of the assailant turned quickly to men who had worked on the Hone plantation. Hone often employed laborers who would help him tend the pineapples, which is a labor-intensive crop, especially during the summer harvest months. In the Fall, new plants would be set so they could begin their two-year growth cycle to bear fruit. One person questioned soon after the crime was Billy Kelly, who had worked for Hone the Friday before the murder and did not show up for work Monday. Kelly was questioned a few days after the murder, arrested, and jailed in Miami. 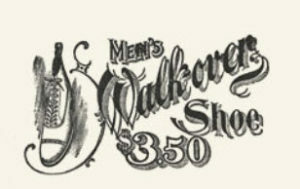 Recall that Mr. Melton’s new Walkover shoes were stolen; Melton’s razor was also taken in that burglary. Another burglary was committed nearby Melton’s at C.S. Archer’s house, where a rifle, bicycle, bicycle pump and bedspread were taken. A search at Kelly’s home turned up the razor and the other stolen items, except the shoes and rifle. This evidence clearly tied Kelly to the shoes found at the crime scene. 1894 Winchester Rifle of the type used in the crime. A boy walking on the scrub trail to Potter’s Station found the rifle November 22, about a month after the murder. He gave it to an adult who then turned in the rifle to a deputy sheriff. The sheriff took the rifle to Hatchett’s hardware store in town where the rifle was identified as one an African-American man had brought in looking for ammunition to fit the rifle. Mr. Comstock too was able to identify the rifle. It was no ordinary weapon, but an 1894 Winchester rifle. The original owner of the weapon, Joseph Borman, purchased the rifle in Palm Beach in 1894 at the Brelsford Store when it was located where the Flagler Museum is today. There were only three such guns sold on the lake. Mr. Borman had loaned the rifle to Mr. Archer when it was stolen by Mr. Kelly for use in the crime. 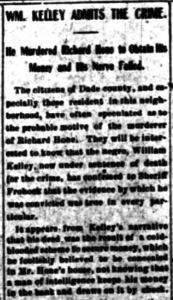 William Kelly’s trial for murder was on the Spring circuit court docket in Miami with Judge Minor S. Jones presiding; Kelly’s case would draw the most attention. Two attorneys were appointed by the judge to represent Kelly – Mitchell D. Price and H.F. Atkinson. 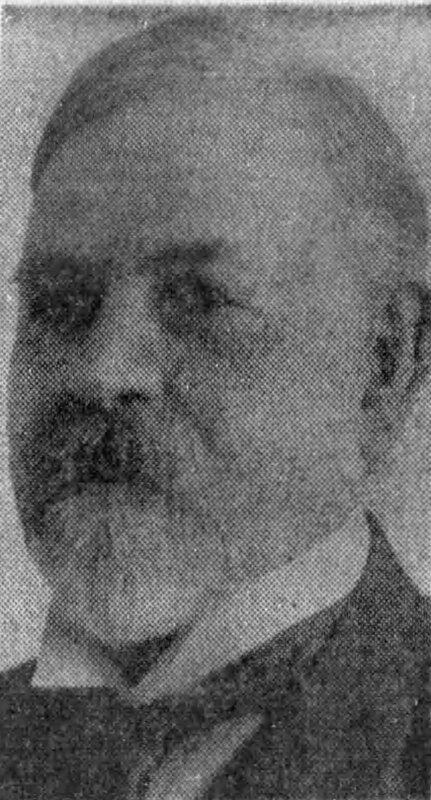 Judge Beggs was the state attorney, assisted by H.B. Saunders, who had served as coroner in the original inquiry. The trial took place February 18, 1903 and lasted one day. “The evidence in the case was all circumstantial, but the presentation had procured a whole chain, and link by link it was fastened together until it had bound the prisoner in the hopeless fetters.” (The Miami Metropolis, February 20, 1903). By 7:30 PM, the judge had turned the case over to the jury. The jury returned a guilty verdict at 9:00 PM, with sentence being death by hanging. The case was somewhat novel in that it only involved circumstantial evidence – no one could identify Kelly as the assailant as a direct witness. 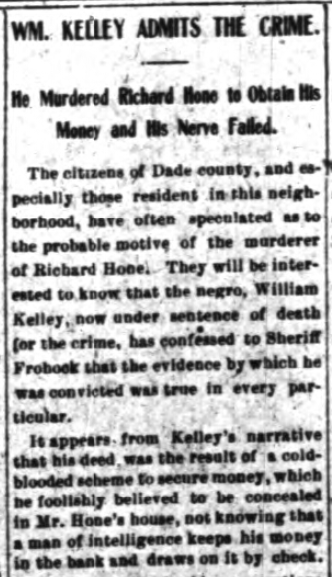 “The case was perhaps of the clearest and strongest ones, of only circumstantial evidence, ever tried in this state.” (The Miami Metropolis, February 27, 1903). There was an attempt by Kelly’s attorneys to be granted a new trial based on how the jury delivered the verdict. Judge Jones had them correct the verdict and the request for a new trial was denied. While awaiting execution in the county jail, Kelly confessed his crime to Sheriff Frohock. Kelly believed that Hone kept large amounts of cash in the house. Kelly had practiced firing the rifle, and threw the spent shells between the two buildings where he lived. Kelly had first stalked Hone on Sunday night before the murder. He returned Monday and proceeded to kill Hone. After he fired the shot, Kelly hid behind an oleander bush as Mary ran from the house toward Comstock’s house. Kelly then entered the Hone house, looked for the money, and found none. He gazed upon the lifeless body of Hone as it lay in the hallway. Kelly was asked why he did not shoot Mary as well – he explained that his feeling of revulsion was so strong after killing Hone that he could not shoot Mary; his thoughts only went to finding money and escape. He sat on the porch, thinking about his escape when he saw Mary and Mr. Comstock walking toward the house. He hid again behind the oleander. As they entered the house, he crept to the window and watched as Mr. Comstock examined Hone’s body. 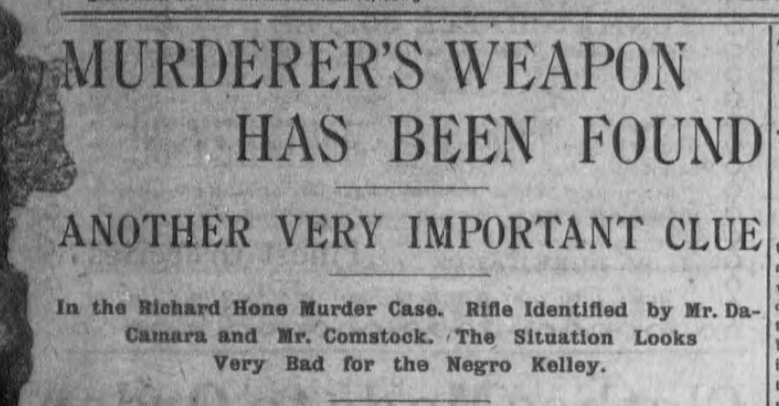 Kelly then proceeded to Comstock’s house where he broke the door with the rifle. 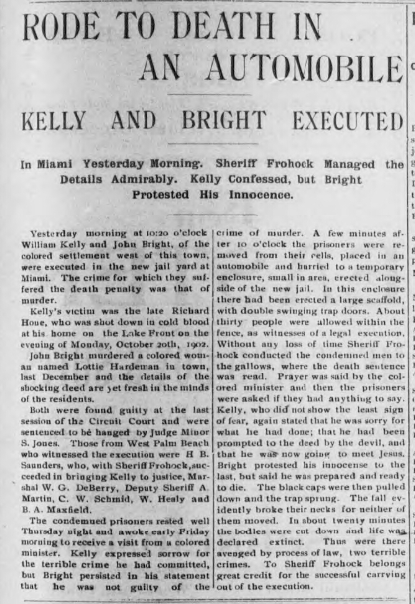 Kelly said “I killed a man, and I want to give my life for his – he was a good man too.” (The Miami Metropolis, March 27, 1903). Friday, April 10, 1903 would be William Kelly’s last day. It was now time to pay society for the crime committed. 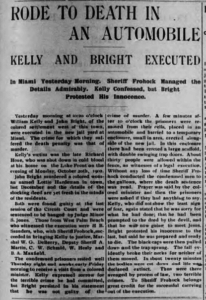 Kelly was taken to the gallows in an automobile, as the headline in the Tropical Sun proclaimed, a novelty in 1903. Kelly was hung with fellow prisoner John Bright who was also convicted of murder. Gallows had been constructed for the two in the new Miami jail yard. Kelly’s last statement said that the devil had “prompted him to the deed” and that he would be going “to meet Jesus.” Black hoods were placed over their heads, and the trap sprung on the gallows. Both men were declared dead after being cut down from their ropes. This should logically be the “end of the story,” but many interesting facts remain about the Hone case. 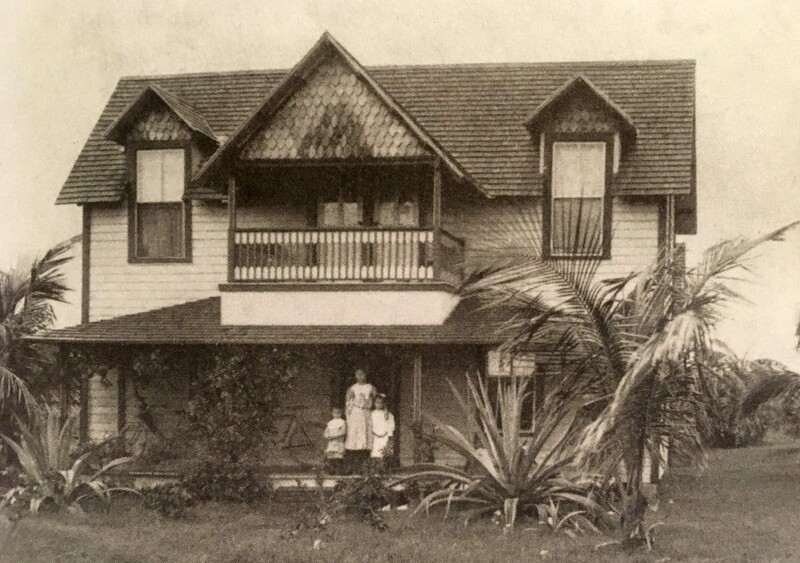 Mary mortgaged the house and 20-acre pineapple farm to James Olmstead on December 30, 1904 for $3,000. Olmstead then sold the mortgage to George G. Currie only a year later for $5,000; Mary paid off the mortgage in 1907. 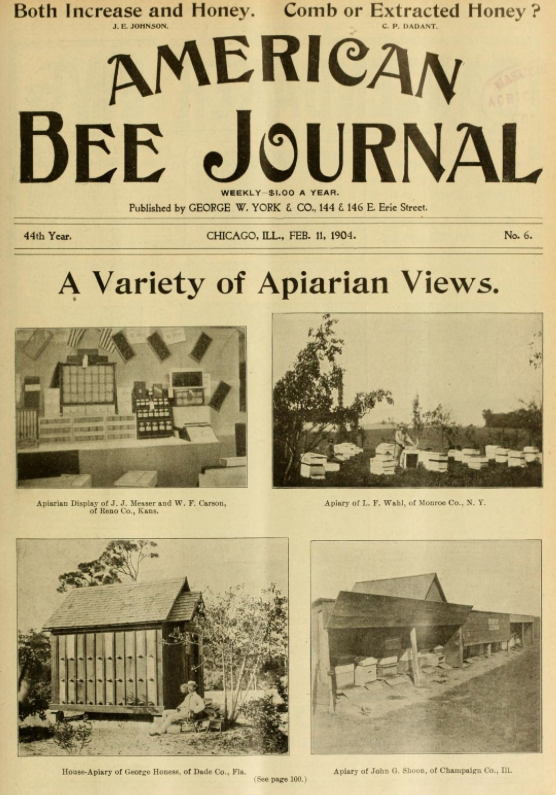 In 1923, Currie sold the property to William Ohlhaber, a well-known Chicago architect. Ohlhaber wanted the property to park his yacht, according to family members. 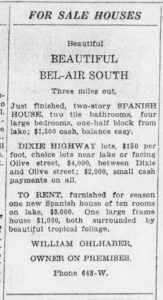 Ohlhaber subdivided the property to become Bel-Air, one of the “Roaring Twenties” developments in what was then called South Palm Beach. 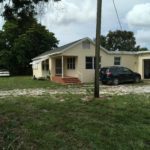 Mary continued to live in West Palm Beach, living in a house at the northeast corner of Olive Street and Evernia. 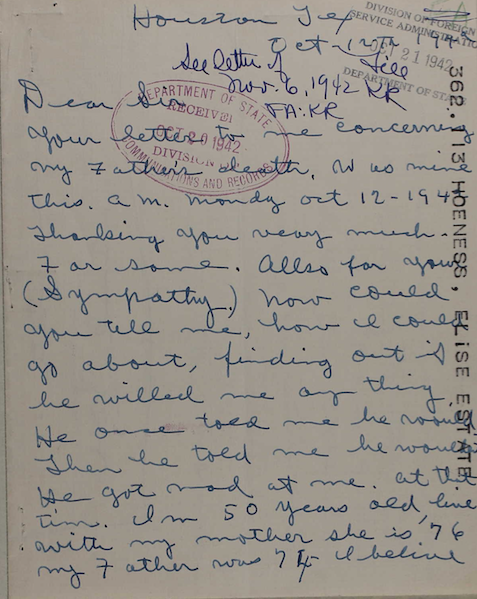 In 1919, she applied for a passport to visit her ailing mother in England. She sailed back to England from New York on the Cunard Line, never to return to West Palm Beach. George Currie visited Mary while on a tour of England and found her well, back in her childhood town. Mary never remarried, and passed away in 1946. 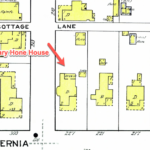 The big storms of 1926 and 1928 and the subsequent Great Depression left Ohlhaber’s Bel-Air subdivision with dozens of unsold lots. In 1947, Max Brombacher, a Henry Flagler employee, bought the Hone house and surrounding property. The house remains in the family hands today, and is considered by most historians to be the oldest house in West Palm Beach (portions of a log cabin built by Elbridge Gale are said to be a part of a house in Northwood, but the house is not in its original location). 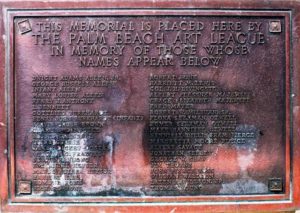 It is in all likelihood the sole remaining structure that Charles C. Haight built in West Palm Beach that is still standing. Richard Hone’s resting place has also seen its share of news over the years. Hone was buried in Lakeside Cemetery, which was at one-time a private cemetery owned by the Lake Worth Pioneers Association. The Association deeded the cemetery to the city of West Palm Beach in 1920 to become Pioneer Park. Most of the burials were moved free-of-charge by the city across the street to Woodlawn Cemetery. Most – but not all. Art collector Ralph Norton proposed building an art museum and school on Pioneer Park, and the city agreed. As part of the agreement, the Lake Worth Pioneer Association holds their annual picnic on the grounds of the Norton Museum. How many burials remain under the Norton is a question that never will be answered. A plaque that once hung by the Norton entrance listed 40 names, but with no mention as to why these 40 names were inscribed. There among them is Richard Hone and two of his children. 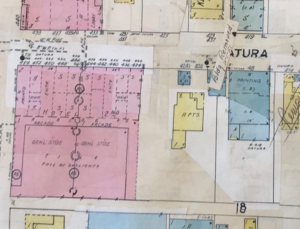 In the 1920s, the widening of Olive Street revealed many burials that had been forgotten. 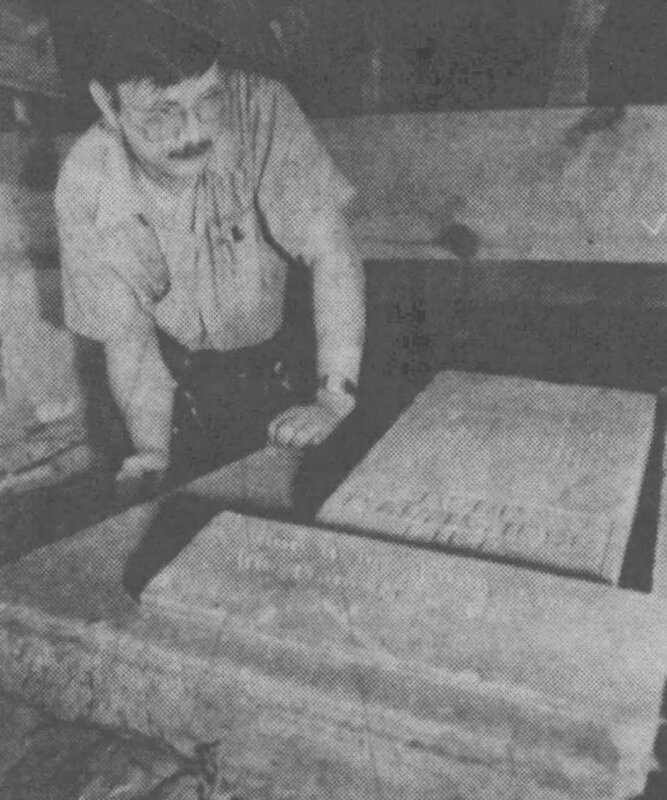 In a 1985 discovery, a Norton Museum employee entered a crawlspace under the auditorium in the building and found several forgotten headstones. Most prominent among those was the headstone of Richard Hone, thus inscribed from Job 3:17 “There the wicked cease from troubling and the weary are at rest.” This again stirred up the controversy on the fact that the Norton Museum was built on hallowed ground. At the current time, the whereabouts of the headstone are unknown. The Hone house and its survival, and the rediscovery of Richard’s headstone, ensured that his story would not be lost to history. The old newspapers accessible through the Internet, and genealogical records, helped to finally crack this case. May Richard Hone rest in eternal paradise. I love old Florida pictures, especially those that capture a time or a place that is today completely transformed. An old photo intrigued me on Facebook; its owner was looking for the location of where the photo might have been taken. 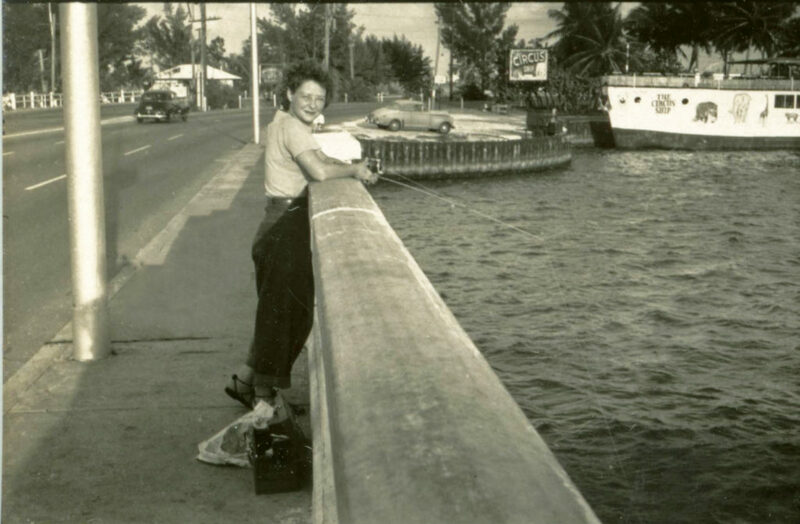 The image, seen below, is of a smiling young woman fishing from a bridge. On the right was an intriguing clue – a vessel called The Circus Ship. The name was stenciled on the side of the ship along with several painted animals. A small sandy parking lot and a roadside sign also announced the ship’s berth. 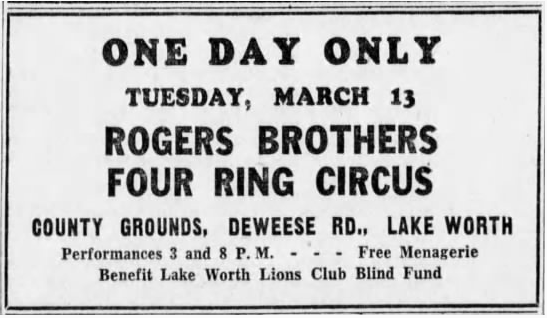 Many of the early comments on Facebook speculated that the picture was taken in the Sarasota area, given that the Ringling Brothers Circus had its winter headquarters in Sarasota. exact location of where The Circus Ship docked, and where the woman was standing on the bridge. 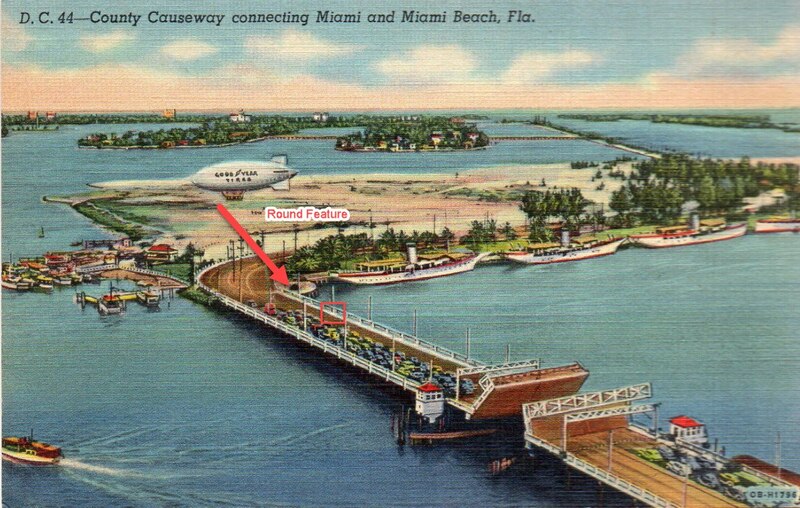 The key feature was a small rounded embankment at the causeway, clearly visible in both the fishing picture and the postcard and noted with the arrow. The woman was standing about where the small red box is on the postcard. There was the small man-made Watson Island on the MacArthur Causeway, with the Goodyear Blimp base and several small ships moored along the western edge of the island. Watson Island of course is still there, now home to the Miami Children’s Museum and Jungle Island, the renamed old-time Parrot Jungle attraction. The cruise ships now dock a few hundred yards away on Dodge Island. 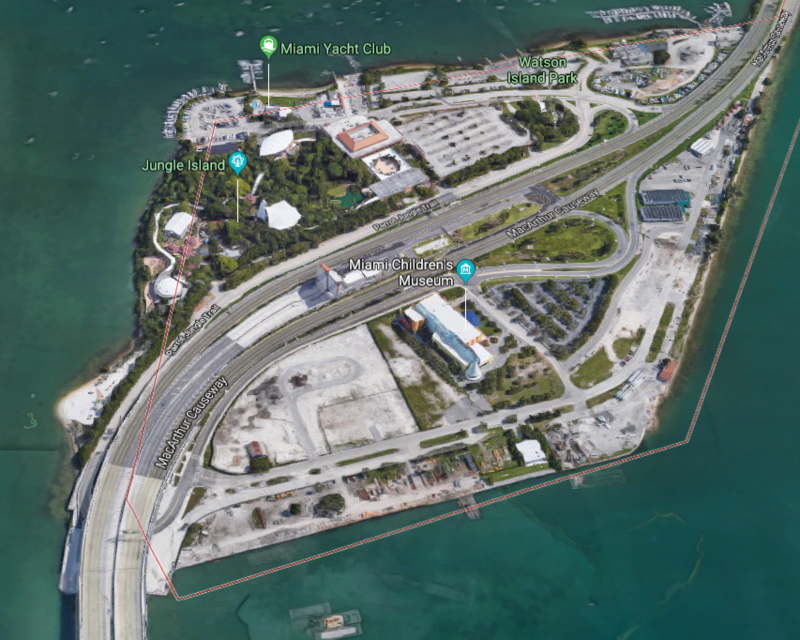 The small round embankment is long gone, encased in layers of concrete, and today no one fishes from the MacArthur Causeway. 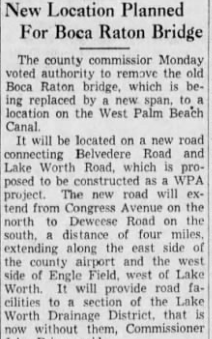 But 1950 was a very different world, as Miami emerged in post-war America. That casual fishing shot captured a little piece of forgotten Florida history, and The Circus Ship’s place in history is assured. Special thanks to Lawrence Kraemer for permission to use the photo of the woman fishing from the causeway. 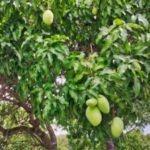 It is said in India that mangoes bring Eternal Life. I don’t know if that’s true, but I did stumble across a little piece of Heaven, tucked away in a West Palm Beach neighborhood. I was out exploring with Janet DeVries Naughton, trying to find what looked like some sort of grove from the Google maps aerial map, near Dreher Park. Up and down the streets we went…and came upon Camellia Road. I had read an article that this was where David Sturrock lived, one of the area’s early residents and horticultural expert on mangoes. Sturrock, born in Scotland, came to Miami in 1913 at the age of 20. 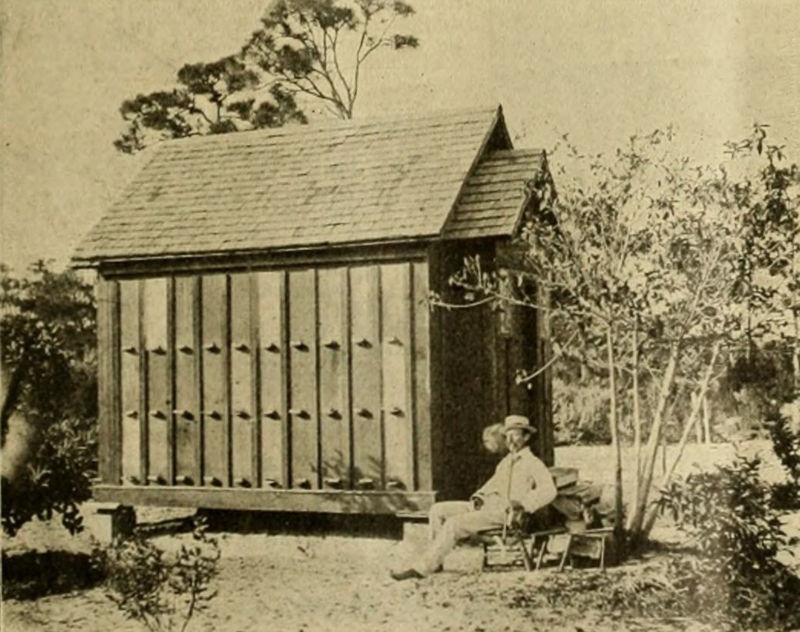 He began working in the horticultural field on the Deering Estate in Miami (today’s Vizcaya). 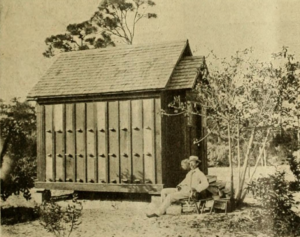 Later he worked in Cuba at the Hershey Agricultural Station and was superintendant of the Harvard Botanical Gardens. He then settled in West Palm Beach with his four children. 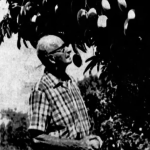 In the 1950s, he began his love affair with mangoes and developed many new varieties. 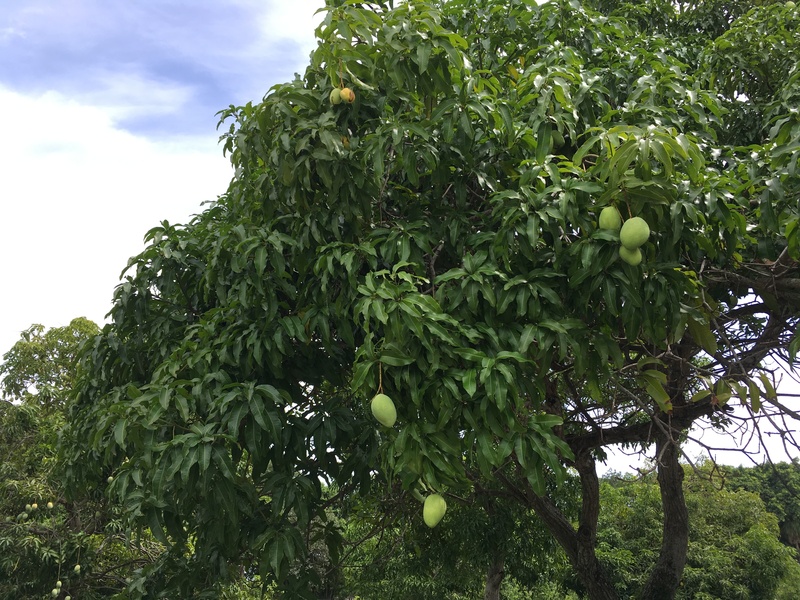 Sturrock worked with colleague Edward Simmonds on some mango hybrids and the result was the Edward, still grown today. Sturrock struck gold with his next creation – the delectable Duncan mango, named for Ralph Duncan who had drawn maps for one of Sturrock’s books. I sampled this mango and I can attest that it is delicious, peachy, with no fiber or odd taste that many Florida mangoes can have. David Sturrock lived on his beloved farm to the fine age of 84, eating the beautiful fruits in all manner from fresh, to jams and chutney. 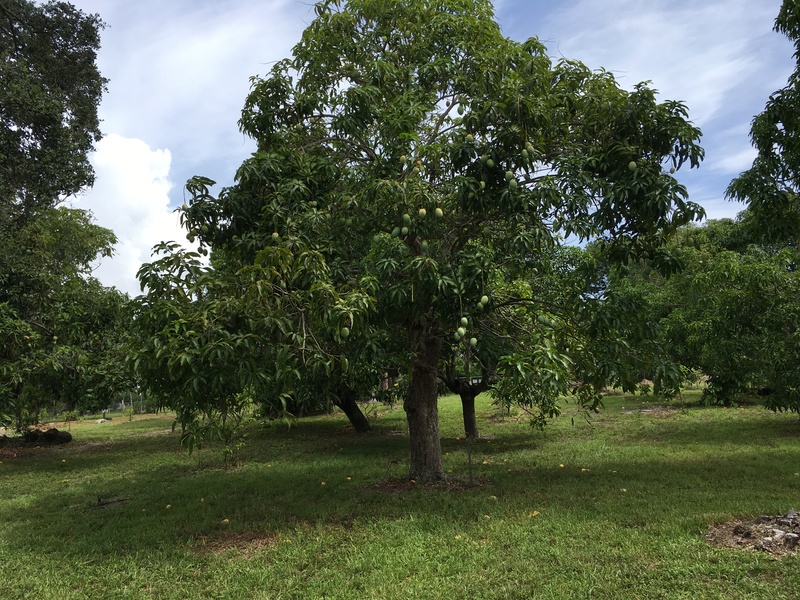 And that brings us to the slice of Heaven, or what I call The Land that Time Forgot – somehow, the Sturrock farm exists in the sprawling West Palm Beach, still selling the delectable mangoes. 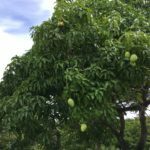 At this writing in July 2017, Palm Beach County is in the middle of mango season. The original Sturrock home still stands on the property, surrounded by mango trees in all stages of growth – babies not yet bearing, to giants with enormous trunks. It is all here, just as David Sturrock left it. The farm, under the moniker Tropical Acres Farm, 1010 Camellia Road, is just south of Southern Boulevard on Parker Avenue. 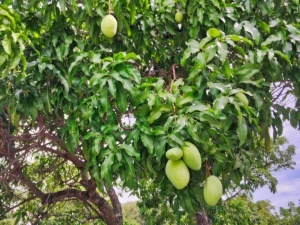 The farm is open daily during the short summer mango season. Find them on Facebook at https://www.facebook.com/TropicalAcresFarms and make sure they are open before you venture to the farm. The postal service’s role in our everyday lives has changed so much that it is hard to imagine how important the postal service was to people years ago. With email, digital publications, and online bill pay, we simply do not “get the mail” as we used to. But imagine a small community emerging from sugar sand and pine woods – fledging Westpalmbeach, as it was spelled then, a little sister to the grand resort of Palm Beach. The post office that emerged has seen its share of unusual characters serve as postmaster, sometimes with tragic results. When John C. Stowers arrived on the scene, fresh from adventure mining for gold in the Black Hills of the Dakotas, he wanted to open a grocery store. The Maine-born man could see that the community needed a post office, so he applied for one on March 8, 1894 with the Post Office Department in Washington D.C. On April 17, 1894, Stowers was appointed postmaster of Westpalmbeach and opened the first post office in a tent at the corner of Clematis and Narcissus. 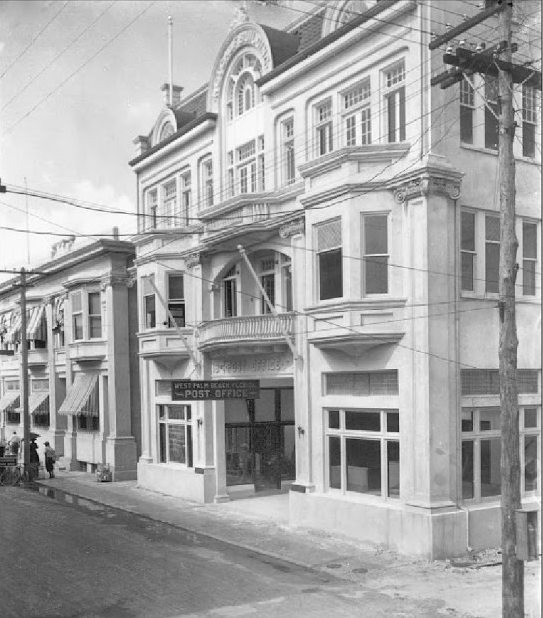 On his lots, Stowers planned to construct a wooden building with space for his post office and a grocery store on the first floor, and office space on the second; but the need for hotel space led him to instead build the Palms Hotel, with a space for the post office and other shops on the ground floor. 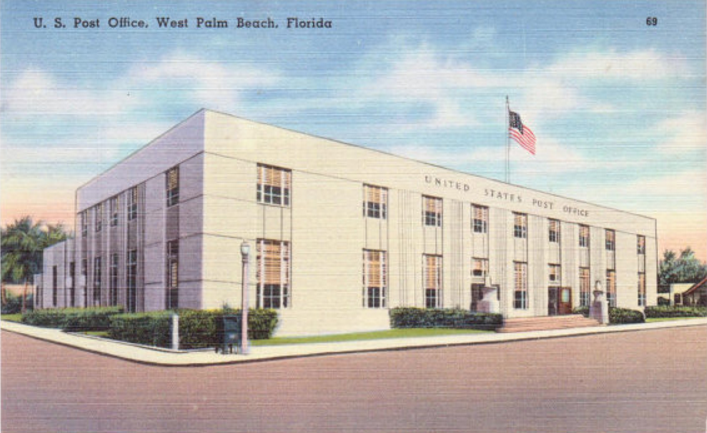 On April 11, 1895, West Palm Beach had its first real post office building. West Palm Beach saw two tragic fires in 1896, and many blamed the town’s name as it had 13 letters; it was about this time that the name was officially changed to West Palmbeach, and finally, West Palm Beach on postal records. 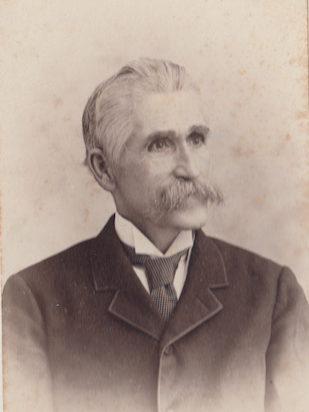 Stowers served 16 years as postmaster, and was succeeded by J. Paul Clarke on March 2, 1910. Clarke would achieve his fame not from postal work, but from his work with poisonous snakes, which he kept at the post office and in a museum adjacent to his house on Rosemary Street. More about that later. The third postmaster was appointed November 29, 1913 and was a man all in the community knew – Guy Metcalf, who published the area’s first newspaper The Tropical Sun, put in the first road to Miami, and sold real estate through his Tropical Exchange Company. With Metcalf, the post office gained a new home. Metcalf’s father, Judge W.I. Metcalf, built an office building at 107-109 North Olive Street, and rented out space for the post office on the first floor. The Metcalf Building still stands; it was remodeled twice as part of Hatch’s department store, then the first J.C. Penney in West Palm Beach in 1940, and later in 1950 it was remodeled again into a Burdine’s store. Metcalf’s tenure as postmaster was short; he was succeeded by J.D. Argyle. 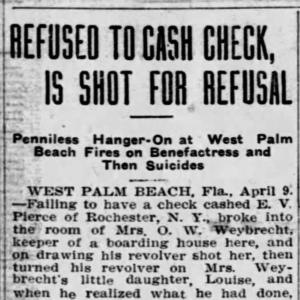 Guy Metcalf, who was elected the Palm Beach County Superintendent of Public Instruction, died tragically in 1918 when he committed suicide in his courthouse office over a disputed bill. In 1920, West Palm Beach had its first woman postmaster in Miss Lena M. T. Clarke, Paul Clarke’s younger sister. 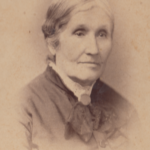 She had served many years as assistant postmaster, and served a couple of stints as acting postmaster, and was finally appointed to the top spot. But after Paul Clarke died from a coral snake bite on Christmas Day, 1920 in his makeshift museum, Lena’s life began a downward spiral. 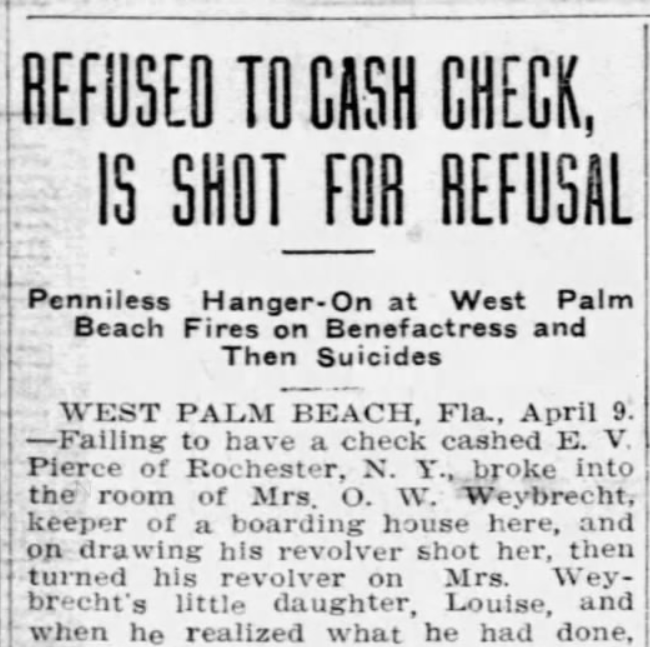 A rumored affair with a married man left her scorned and looking for revenge – she found it when she shot her alleged former lover and fellow postal employee Fred Miltimore dead on August 1, 1921 in Orlando. Postal authorities immediately removed Lena from the postmaster position and she was replaced with C.W. Campbell. 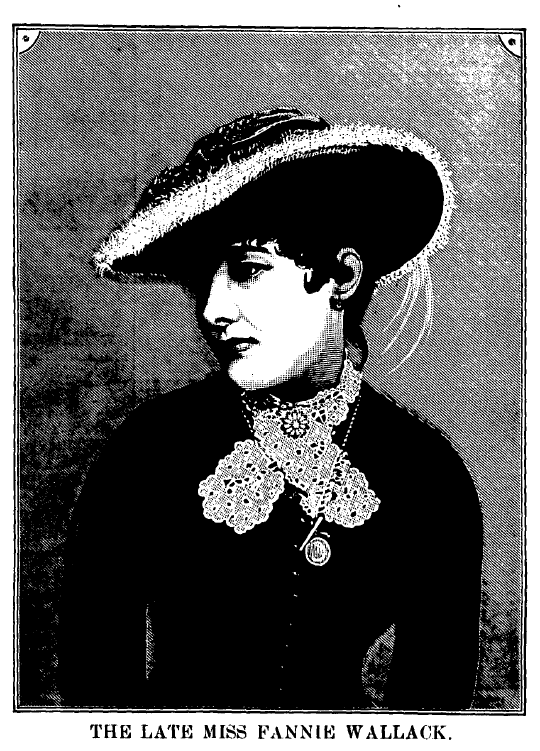 Lena Clarke was eventually found not guilty of murder by reason of insanity (see this blog for a more detailed account of the Clarke murder case). 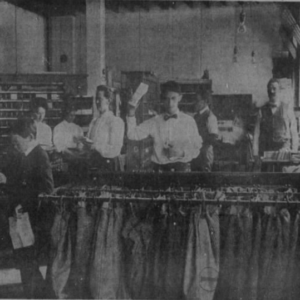 As West Palm Beach prospered, the post office outgrew the Olive Street location. Larger quarters were built at Datura and Railroad Avenue (today’s Quadrille). The Post Office Arcade housed the post office and other businesses such as real estate offices. Being housed near the post office was a selling point in many real estate ads. With the new building came new postmaster George W. Smith. This post office served West Palm Beach through its “Land Boom” years in the 1920s. The 1928 Okeechobee hurricane and the 1929 Wall Street crash swept away all the big plans and big money from West Palm Beach. In 1934 O.B. Carr was named postmaster at the height of the Depression. 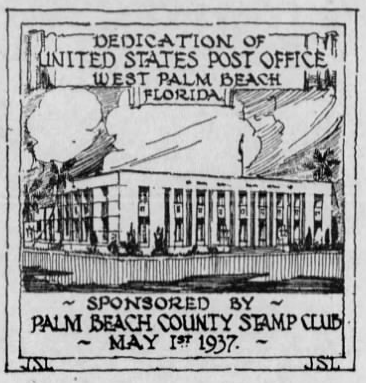 It was about this time that West Palm Beach started lobbying the federal government to build a dedicated post office. Work began on the selected site at Olive Street and Fern in July 1936. 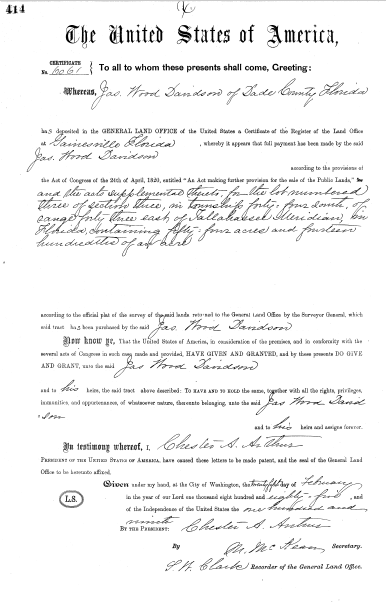 The land chosen had a storied history, being a part of the original homestead declared by Irving R. Henry, who was the first to claim land in what would become West Palm Beach. John B. Beach eventually acquired the land. 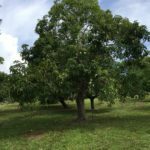 Beach, a nurseryman, raised tropical fruit trees for sale at his large nursery on the site. His widow, Annie Beach, presented the deed back to the federal government, 47 years after it had been deeded to Henry. The Beach house was demolished and rare plants and trees were moved to other locations in the city. Officials laid the cornerstone made of Stone Mountain, Georgia granite on October 31, 1936 at a ceremony with dignitaries present. A sealed lead box with documents of the time was placed in the cornerstone. The Palm Beach Post wrote “Local historians of the future may open the post office cornerstone in years to come… .” Construction continued on the modern concrete and granite building, taken from a California design made to withstand earthquakes – and hurricanes. On May 1, 1937, the new building was ready for business. That building served West Palm Beach for many decades as both a service office and sorting facility. As the 1960s came to a close, once again the need for a new post office developed. Representative Paul G. Rogers was instrumental in seeking funding for a comprehensive federal building and post office for West Palm Beach. A new post office was constructed at 801 Clematis Street, just west of the new Federal Building, named the Paul G. Rogers Federal Building; that site now houses the Social Security Administration building. Finally, the current post office at 640 Clematis Street serves downtown West Palm Beach. The 400 South Olive Street building stood abandoned for years until 1979, when it was demolished to make way for affordable housing for older citizens as the St. James Residence to adjoin the St. Andrew’s Residence. 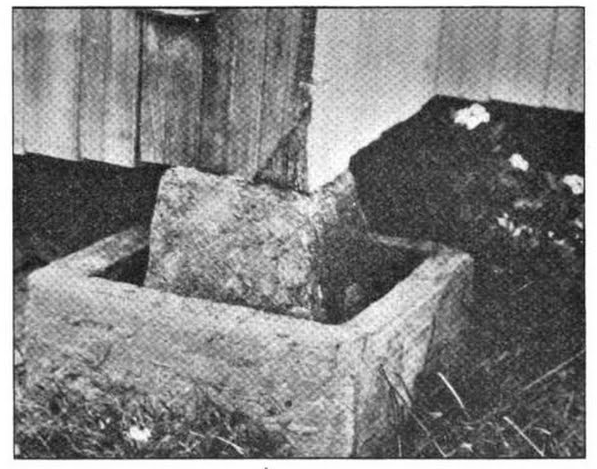 What became of the cornerstone and the lead box with the documents remains a mystery as no mention of the artifacts appeared in the newspaper. Either it went unnoticed by the demolition crew or was taken by a worker as a souvenir. 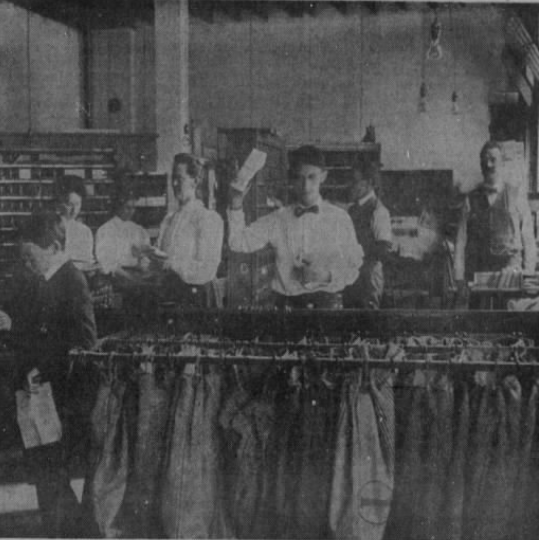 Through all these locations, the same services as over a century ago are provided – mailing packages, purchasing stamps, picking up the mail; but something has been lost from those early days of the post office. 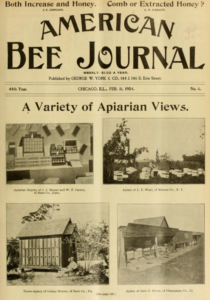 The anticipation of a letter from far away, a catalog with the newest fashions, or an eagerly awaited magazine with the latest gossip is now instantly available to us. The ghosts of those old post office buildings still haunt their original locations with excitement, or dread, and the hope of good news. 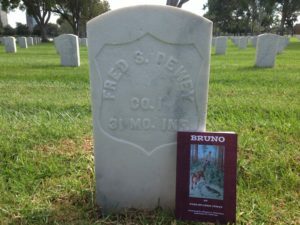 Something was gnawing at me today – a name I see every time I help conduct cemetery tours at Woodlawn Cemetery in West Palm Beach – an unusual name belonging to a woman whose husband is among the most well-known local pioneers. Charles W. Pierce, of Barefoot Mailman fame and chronicler of local history, married a woman named Yallahs Lizette Wallack February 26, 1896 in Lemon City, north of Miami. It was said she was from Jamaica, but nothing more was known of her. I surmised she was named for the Yallahs river in Jamaica. The 1910 federal census entry for Yallahs states that both her parents were born in England. Yallahs died early at age 47, February 14, 1922. Articles had mentioned she was treated for an illness at Jacksonville and at Johns Hopkins, and was not expected to live. I began to search for Jamaican records in various sources such as Familysearch.org and general Google searches. A most unusual story emerged, pieced together which told of her famous parents. 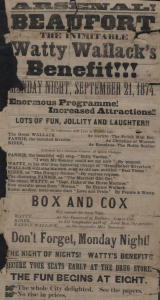 I found the first clue in a book by Errol Hill titled “The Jamaican Stage, 1655-1900.” In it, Hill told the story of Walter Hope “Watty” Wallack, born January 23, 1830, a traveling showman from Liverpool, England who was a one-man production of comedy, singing and acting involving dozens of characters he would portray on stage. 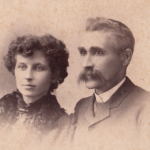 The book mentions his many stops in Jamaica, with his young wife, Fannie Wallack. 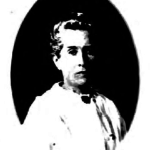 Searching their names revealed that Fannie Wallack died of malaria when only 30, and her obituary helped to crack the case. Fannie Louise Petersen was born in London, England May 1, 1854. 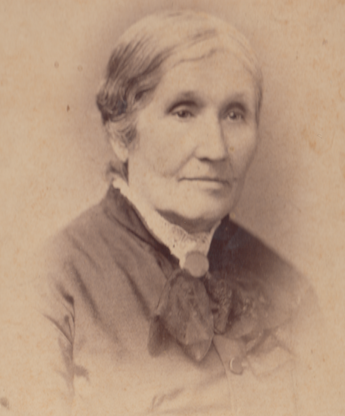 She traveled with her parents to St. Kitts, where her father, Peter Petersen, a native of Sweden, had a mercantile house. Fannie’s musical talents were known very early, with her beautiful soprano voice. She first appeared with Watty Wallack at the age of 10, and married him when Fannie was 15 in the Cathedral of St. John’s, Antigua. 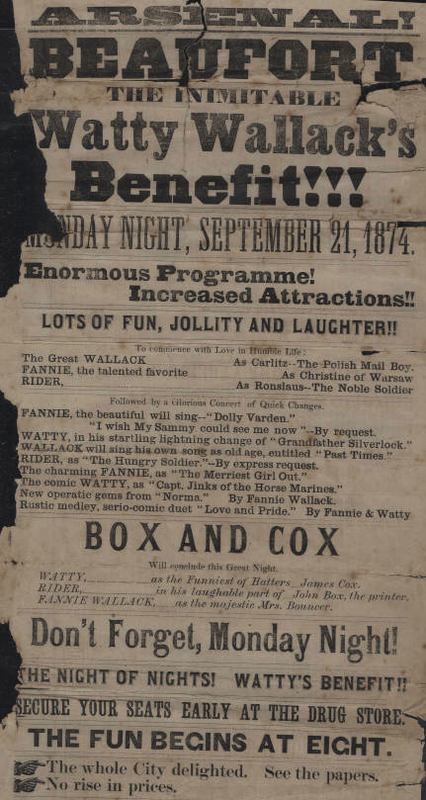 Together with Watty Wallack and his cousin the comedian James A. Rider, the three formed the group “The Wallack Tripologue.” They toured the Carribbean, South America and the American South. In 1872, Yallahs Wallack was born in Jamaica, probably as her parents were on tour, and her emigration date to America was listed as 1874. In 1880, Yallahs appears on the federal census as living in Key West at the age of 8 (listed as the phonetic “Alice Wallack”), with the Patterson family, one of Key West’s most important families. 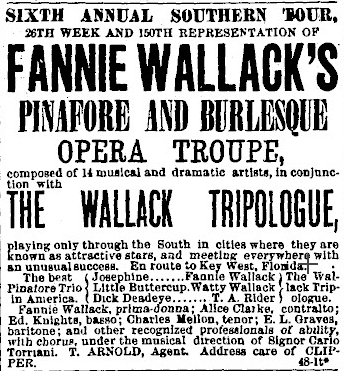 Fannie Wallack died in Kingston, Jamaica, November 26, 1885 at the age of 30. Her obituary mentions “She leaves one child, a daughter thirteen years old, who is at college in Key West, Fla.” It could be that Yallahs was boarding with the family while attending school in Key West. Fannie Wallack and her troupe were renowned on the stage. In 1881, they played a six-month stint at Vercelli’s Theatre on East 42nd street in New York City. Fannie could sing in seven languages, and was much loved for her singing, dancing and elaborate costumes. The resemblance between Yallahs and her mother in the illustration below are striking. Yallahs eventually moved to Lemon City where she met and married Charles W. Pierce, and the couple moved to Boynton at its beginning. They had one child, Charles Leon “Chuck” Pierce, one of the first babies to be born in Boynton, who had a long career in banking. The Pierce family lived on Ocean Avenue, where Yallahs passed away. She now rests at Woodlawn Cemetery, with Charles by her side.